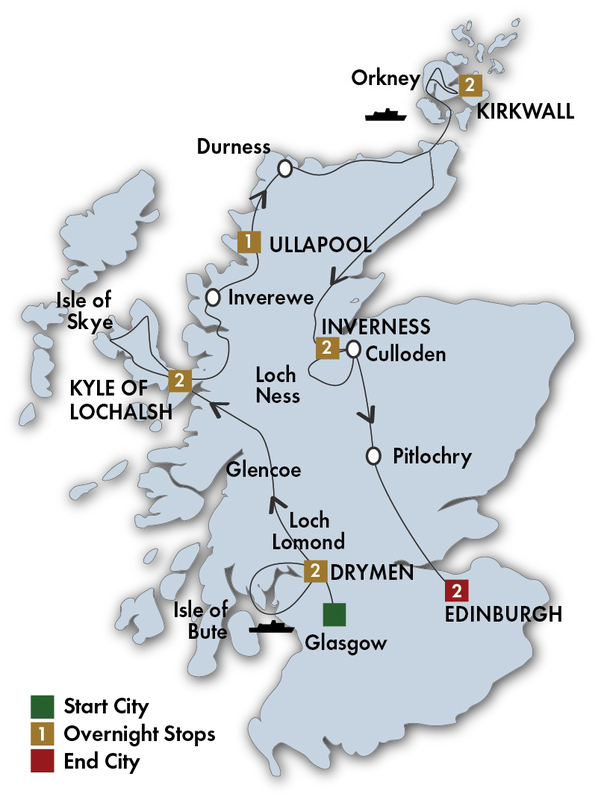 CIE Scottish Isles & Glens Tour - CIE Tours International tours. Lowest Prices! Expect an unforgettable evening of music, ceremony, theatre and dance with reserved seats for the Royal Edinburgh Military Tattoo on July 27 – August 12 departures. Relax and enjoy dinner on board a ferry as you cruise to the Orkney islands. Dunrobin CastleInverewe Gardens Inverewe Garden is a botanical garden in the Scottish Highlands. It is located just to the north of Poolewe in Wester Ross, and is noted for the breadth of its collection. Isle of Skye The Isle of Skye is the largest and most northerly island in Scotland’s Inner Hebrides. The island is dominated by the Cuillin Hills and is often referred to as the “Misty Isle”. It is associated with Bonnie Prince Charlie who fled there after the Battle of Culloden. Loch Ness Cruise This large, deep, freshwater loch in the Scottish Highlands is approximately 23 miles longand forms part of the Caledonian Canal. It is the second largest Scottish loch by surfacearea at 21.8 square miles after Loch Lomond, but due to its great depth, it is the largestby volume. Loch Ness is best known for the alleged sightings of the legendary Loch NessMonster, also known as “Nessie”. Mount Stuart House Ring of Brodgar The Ring of Brodgar is a Neolithic henge and stone circle about 6 miles north-east of Stromness on the Mainland, the largest island in Orkney, Scotland. It is part of the UNESCO World Heritage Site known as the Heart of Neolithic Orkney. Skara Brae These 5,000-year-old ruins are of an incredibly well preserved stone settlement containing an intricate maze of dwellings. The site was revealed in 1850 by a violent storm and is now one of the most famous Neolithic sites in Northern Europe. Urquhart Castle sits beside Loch Ness in the Highlands of Scotland. The castle is on the A82 road, 21 kilometres south-west of Inverness and 2 kilometres east of the village of Drumnadrochit. 11 breakfasts(B) and 9 dinners(D) including a fun Scottish evening in Edinburgh with traditional songs, stories and dancing.